New York City’s maritime past comes alive at South Street Seaport Museum. Here adults, families, and children can see, touch and enjoy the city’s rich and diverse maritime past in the 19th century district where it all began. Explore the decks and cabins of six historic ships, see exhibitions of maritime art and artifacts, discover New York’s archaeological heritage. Journey through the area’s stone-paved streets as well as the little shops all along he way. Learn to use a 19th Century letterpress, sail around New York harbor on a graceful twin-masted schooner or excursion vessel. 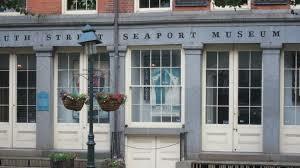 South Street Seaport is a complex of restored 19th century buildings located on the waterfront of the East River. The two block area of short brick buildings and cobblestone streets are a sharp contrast to the modern skyscrapers of downtown Manhattan. The port is as much an outdoor mall as it is a museum; the on-shore galleries, housed in restored buildings, are in three separate locations within the seaport’s borders, while the rest of the space is occupied by stores and restaurants. Except for South Street itself, the area is closed to automobile traffic, and the overall sense of the seaport is similar to other historic parks like Colonial Williamsburg, but on a much smaller scale. The exhibit on board the Peking, one of the two tall ships at South Street, offers a good impression of what life on an old sailing cargo ship was like. The galley, crew quarters, officer’s staterooms and captain’s cabin have all been restored to their original condition. The gallery is full of photographs taken while the Peking was in service and there are also excerpts from the logs of the captain and crew with details about daily life on board the ship; one sailor commented that the bread served to the crew was so hard that it could put a dent in the door! There is also historical information about the ship and the company that owned it. The exhibits on board the ships are, for the most part, in cramped cabins and would not be good for people who are claustrophobic. The onshore galleries cover a more broad range of topics; you’ll find everything from antique clocks to old charts, including the extremely inaccurate 16th and 17th century maps drawn by early European explorers. There is also an assortment of models ranging from sailing ships to 20th century steamers. South Street Seaport appeals to just about everyone. In addition to the exhibits, there are several different boat cruises that leave from the Seaport and numerous stores in the historic area. Although the galleries are arranged to be easy to walk through, the cobblestone streets can be hard on the feet. Two things that visitors should be aware of are that the best time to arrive is between 10:30 and 11:00am and that the area sometimes smells bad because of the active fish markets nearby. A visit to South Street will take at least a half a day and a full day trip wouldn’t be unreasonable if you also want to take a harbor cruise.